An American beer lover is taking world’s largest brewer, Belgium’s AB Inbev, to court because the Leffe he bought wasn’t actually brewed by monks in an abbey. H Vasquez claims that the label says otherwise. The label says something along the lines of “brewed and perfected by Belgian monks since 1240”. This tradition would have been supported until now by “750 years of Belgian tradition”. The label also shows a picture of a church tower and an abbey. Vasquez thought that this beer must therefore clearly be brewed in a brewery, as is the case with other Belgian beers like Chimay Rouge and Westvleteren 12. However the Leffe abbey was destroyed in the French revolution in 1794 and the beer is currently produced in a huge brewery in Leuven. Leffe is currently produced in the same brewery that produces Stella Artois, one of Belgium’s famous export beers. This is a massive plant that has a brewing capacity of 9 million hectoliters or 238 million gallons per year! Vasquez therefore claims that he paid too much for the beer, which is advertised as being a “craft” (like) beer. But this, correctly, doesn’t seem to be the case. 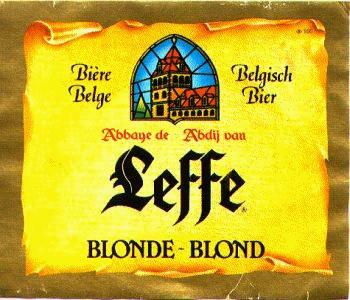 This is the reason why Mr Vasquez filed a formal complaint wit the federal court in Miami, demanding compensation and a formal statement from Leffe that it is no longer brewed in an abbey. It appears the American might have a decent chance at winning the court case. Last year the same court settled a case where AB Inbev was ordered to pay 20 million USD to Beck’s drinkers because it claimed to be a German beer, while it was actually brewed in the US. My opinion is that, if taken literally then the label is certainly not putting out correct information. Leffe is certainly not brewed by monks in small batches in a hard to find monastery, like Westvleteren 12 is. So Vasquez is certainly right there. Another statements from his lawyer says “Their marketing quite clearly shows Leffe to be a specialty craft beer […] Consumers believe they are buying something that is limited quantity and very high quality” - this is not mentioned explicitly on the label and has therefore been interpreted as such by Vasquez and / or his lawyer. Taking a brewery to court over something like this is going a step too far, in my humble opinion. Our favourite beer Westvleteren 12 of course doesn’t have this problem for the simple reason that there no labels on the bottle!